Lake Houston Vacation Home, Breathtaking Views, Floor to Ceiling Windows. ** Rare Find ** Family, Friends, Executive, Corporate Estate on Lake Houston. Waterfront Estate home with floor to ceiling windows and 180 degree panoramic views, sits on nearly an acre on Houston’s Best Kept Secret, Lake Houston. This gorgeous waterfront retreat - featured in Better Homes and Gardens magazine - features 3 total bedrooms and 3 bathrooms. 2 Master bedrooms in an unbelievable setting. Fully updated and remodeled in 2018, the property grounds are private and wonderfully maintained. A nearly unobstructed panoramic view, a covered gazebo with a pond nearby, and good fishing off a private pier to name a few of the details! Inside the home you will find 3 bedrooms each with comfy beds. The couch in the living room is a queen-size pull out bed with a Serta mattress. The couch in the front room is another queen-size pull out bed with a Serta mattress. The property has modern washers and dryers. There is dining seating for 11. The kitchen includes 2 ovens, 4 burner range, and vent hood. New fridge for storing your food and beverages. Microwave, toaster oven, coffee maker, all pots and pans, plates and glasses are also included. Dishwasher and a bar round out the kitchen. WIFI throughout the property and HD Smart-TV in the living room. There are too many things to list! Sitting on an acre, it is the biggest and most secluded lot in Indian Shores. 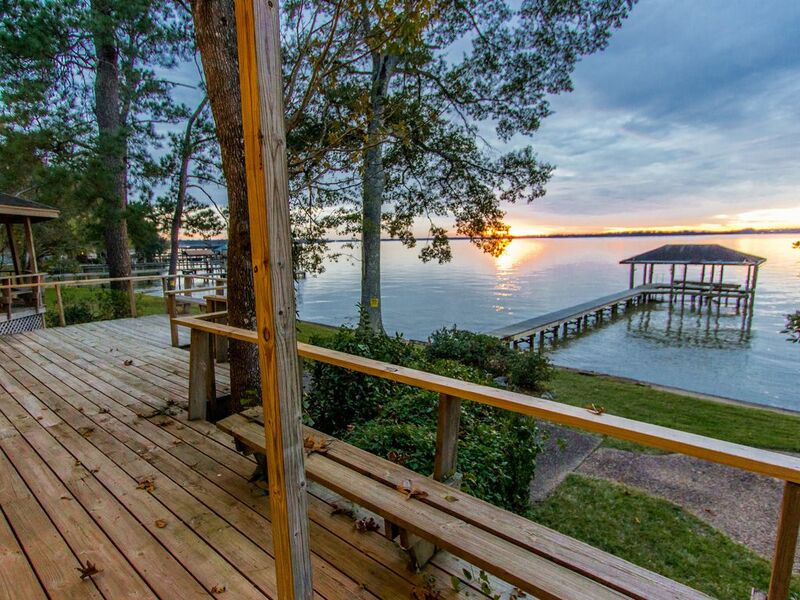 Relax and enjoy the best sunsets on lake Houston from every room of this oasis. Fish from your private dock or utilize the public boat launch. You can even tie your boat up right outside. We consulted with Texas Wildlife to create a fish habitat that is rich in medium to large Catfish, Freshwater Drum, and Carp. Surrounding the house is a 1400 square foot deck and large Redwood Gazebo that offer tranquil views. This is the largest deck on Lake Houston. Tranquility is everywhere. A serenity pond, rock waterfall, and lush landscaping make this an oasis. If you’re looking for peaceful surroundings, this is the place to be. Lake Front Homes in Indian Shores are protected from the daily southerly winds are on the calmest part of the lake! This Houston vacation rental has a lot to offer. Indian Shores also offers a community pool, clubhouse, and 9 hole golf course. Bring your fishing poles, kayaks, canoes, golf clubs, and travel buddies for fun and relaxation in your Lake Houston vacation rental. Having lived in 3 countries and traveled the world, I can appreciate this house as being special. If you would like to research me further, search "Wizard of Google". Featured in Better Homes and Gardens, The Houstonian Magazine, and Coldwell Banker Real Estate as one of the top custom homes with a view in Houston. Lake Houston is the drinking reservoir for Houston. As a result, there are virtually no boats on the lake. It really does feel like your own personal lake. This was the very 1st house on Lake Houston and the 2nd pier on Lake Houston. My grandfather got the first choice of lots. He chose 2.5 lots with the best sunsets. This house has been in my family since I was born. I have spent thousands of hours fishing this property and installing fish habitat. There is no wall space in the living room. Only windows. The View! Floor to ceiling windows in the living room. Terrazzo floors and a deck that surrounds the house. The Gazebo is perfect for meals. The privacy of the lot, the lake, and the serenity pond all serve as anti-stress. San Jacinto River feeds into Lake Houston at the North end and comes out of the dam on the south end. The sunsets from our large covered Gazebo last 2 hours long. Floor to ceiling windows offer a spectacular view from the living room, kitchen, and dining room. This was the very first property on Lake Houston. As a result, the owners of the house chose the very best lot, with the best view for themselves. Floor to ceiling windows, 270 degree view of the property. Single serve Kuerig and a Drip coffee maker. The dining area is attached to the living room. A second dining area is available at the kitchen bar. However, most often people like to eat outside on the gazebo table or the outdoor bench seating. 40" Smart TV, but seriously you'll want to spend your time on the deck. The front porch is covered. The wrap around wood deck serves as a porch. A wood deck surrounds the fish house and serenity pond. Two handicapped people lived in the house prior to me purchasing it. This pool is open during the summer. Just bring your own food, clothes, toiletries, and you're ready to go. Great for the family. I am a native Houstonian, living across Lake Houston and never thought there would be such a GREAT place to retreat to so close to home!! The house is fully stocked and organized perfectly for anything you need. The 60s architecture is just awesome. It’s a house where you can have fun inside or out. The 3 walls of windows and sliding doors allows for a spectacular view. You can see the sunset from that living area or from the gazebo. The house is extremely well taken care of and there isn’t a place where you are not comfortable. It was comfortable for 4 adults and 5 children. One of the best things was to catching and eating our dinner! We will make it a point to book a few times a year! Amazing amazing trip. The owner was very supportive even cleaned up the entire property a day after a major thunderstorm to make sure we could come and visit. The property is the best I've seen in over ten years. I cannot brag on this place enough! We just spent five nights at this property with 10 people and had a great experience. The home is older but has had many renovations and made for a very comfortable stay. It was well stocked with basic nessesities... towels, dishes, soap, etc. It is very clean, well kept and organized with labels reminding us which switches turn on which lights. Small touch that was appreciated. The view from the great room is spectacular... the pictures just don’t do it justice. The gazebo was great for enjoying the views outside while it rained. The grounds are also well maintained. Huge beautiful mature trees that provide a lot of shade. Kids had fun running around outside on the grass with soccer / footballs. We didn’t get in any fishing this trip but we enjoyed kayaking and swimming off the deck. Steve was great to work with and very communicative. Overall, a fantastic deal when comparing prices to two hotel rooms. Would absolutely recommend and would return without question if we find ourselves in Houston again. A nice house with a great backyard set up. From the deck area to the pier very relaxing. House has everything you need. Inside the house with all the windows open great view of the lake. If you want to be 30 minutes out from the city of Houston. Not sure you can find a better spot. Thanks for the kind words. We agree, it is a nice spot. The house is clean and everything we needed was available to us. I especially liked the private and separate bedroom with bathroom off of the main house. It made for a nice place to nap away from the hustle in the house. We're definitely looking forward to going back in warmer weather. Sounds like you got into a few big fish. Glad to hear that you got to experience some good fishing. Even in the rain, the birds will be hunting the water. It makes the time pass nicely. Thanks for the review! My office was on the gazebo. Best office ever! I was concerned about being able to work from the house, but the Internet was great. I worked outside, under the gazebo. The view was unreal. The waves and wildlife kept me company. I saw an eagle carry off a squirrel one day. My wife saw huge cranes and pelicans. No stress work environment. I cannot believe how quiet and peaceful this lake was. We saw 2 to 3 boats per day, and no other traffic. I often go to Houston for business. Since most of my business is spent working from home, I will be using this place instead of a hotel from now on. So glad you chose to work from home, outside on the gazebo. That is my preferred work spot, too. No watercooler talk. Just water. See you next this Spring! The sunsets will last for 2 hours!